This book offers a comprehensive introduction to the different emerging concepts in the innovative area of sustainability and digital technology. More than 20 leading thinkers from the fields of digitalization, strategic management, sustainability and organizational development share clearly structured insights on the latest developments, advances and remaining challenges concerning the role of sustainability in an increasingly digital world. 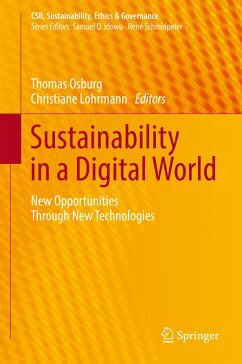 The authors not only introduce a profound and unique analysis on the state-of-the art of sustainability and digital transformation, but also provide business leaders with practical advice on how to apply the latest management thinking to their daily business decisions. Further, a number of significant case studies exemplify the issues discussed and serve as valuable blueprints for decision makers. Dr. Thomas Osburg is Assoc. Professor for Sustainable Marketing & Leadership and Director of the CircularKnowledge Institute, an International Research Think Tank and Strategic Advisory. For more than 25 years, Thomas worked for global IT companies in leading international management positions, with a focus on strategic planning and leadership, sustainable marketing, social innovation and corporate social responsibility (CSR) across Europe. Thomas is on the Board of Directors for Academy of Business in Society (ABIS) and was appointed into scientific MBA committees across Europe. He is teaching MBA classes on "Technology and Innovation Management", "Strategic Marketing", "Social Innovation", "Entrepreneurship" and "CSR" at leading universities in Europe. He has published several books on Social Innovation and CSR Marketing and has written over 30 scientific contributions for leading European journals. Part I: Governance, Strategy and Society.- Part II: Markets, Business and Stakeholders.- Part III: Participation, Education and CSR.